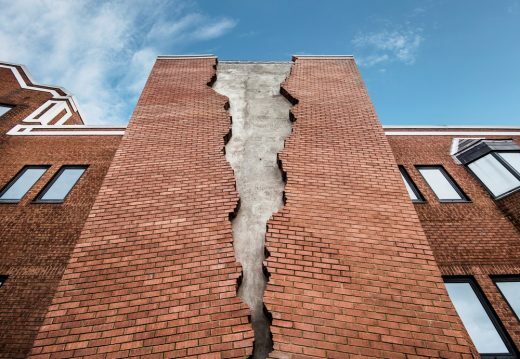 British artist Alexander Chinneck has completed his latest monumental artwork entitled ‘Six pins and half a dozen needles’ on Assembly London, the new office campus in Hammersmith developed by AXA Investment Managers – Real Assets, acting on behalf of its clients. 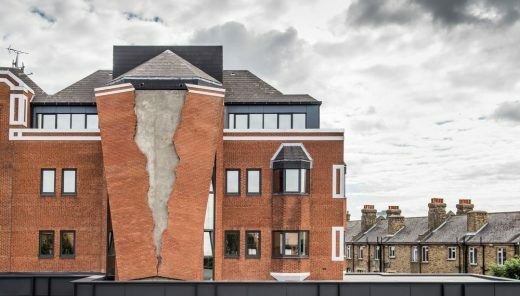 This landmark public artwork is Chinneck’s first permanent sculpture and follows projects that include a 35-metre inverted electricity pylon, a melting house constructed from 7,500 wax bricks and a hovering stone building for London’s Covent Garden Piazza. Reaching 20-metres above ground level and weighing ten-tonnes, the artwork theatrically animates the structure from which it leans, uniting Chinneck’s signature use of art, architecture and engineering to create an ambitious combination of surrealism and spectacle. 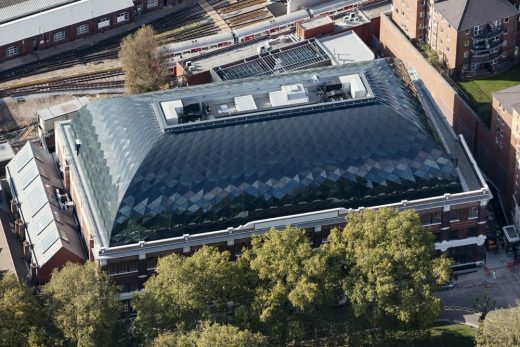 Constructed from 4,000 bricks and over 1,000 stainless steel components, the installation represents a 14-month collaboration of British art and industry with engineers, steelworkers and brick-makers working alongside the artist’s team. The artwork, commissioned by AXA Investment Managers – Real Assets, is situated on Assembly London, a major mixed-use urban campus comprising four buildings totalling 220,000 sq ft. The space will be home to offices, retail units and restaurants designed to create a highly collaborative community based work environment. Prior to redevelopment, the site functioned as the home of a publisher for over two decades and the artwork appropriately resembles a torn sheet of paper, albeit monumental in size, weight and complexity. 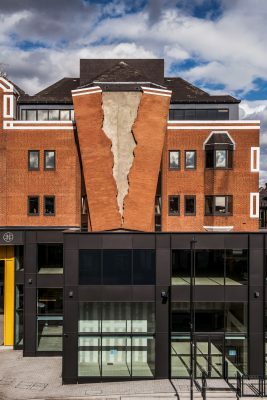 Alexander Chinneck’s ‘Six pins and half a dozen needles’ is a permanent installation and can be viewed at Assembly London, 77 Fulham Palace Road, London, W6 8JA from Tuesday, August 1st, 2017.